The call for College Expo 2019 is now open! 500X Gallery, Texas’ oldest, artist–run, cooperative galleries, hosts one of North Texas’ most anticipated annual student juried competitions. 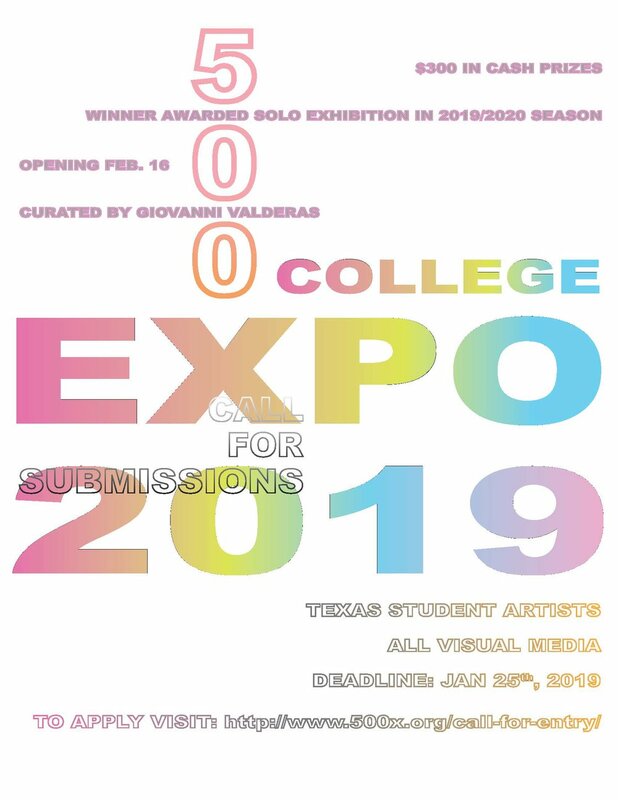 College Expo 2019 is open to all artists over the age of 18 living in Texas. All visual media are eligible, including drawing, painting, sculpture, installation and video (artist must supply all required electronic equipment). All work must be ready to hang. Artwork will need to be dropped off, not shipped. Cost of entry is $30 for 5 pieces. There will be $300 worth of cash prizes and one award for a downstairs project space solo exhibition at 500X during the 2019-2020 season! This year's juror will be Giovanni Valderas. A native of the Oak Cliff area of Dallas, Valderas is the Assistant Gallery Director at Kirk Hopper Fine Art and a visual artist. Previously he was the Gallery Director at Mountain View College. He has served as an appointee by Dallas City Council as Vice Chair of the Cultural Affairs Commission. 500X Gallery, Texas' oldest, artist-run, cooperative galleries, hosts one of North Texas' most anticipated annual juried competitions. Expo 2018 is open to all artists over the age of 18 living in Texas. All visual media is eligible for entry. $300 in cash prizes will be awarded to the juror's favorites! The deadline to submit your work is September 15th by MIDNIGHT! The 500X Gallery is pleased to announce Lee Escobedo as our juror for Expo 2018! Lee is a Texas-based writer and curator. He currently contributes writing to multiple publications and platforms across regional, state, and international platforms. As well, he currently served as editor-in-chief for the arts publication Artist Uprising, an annual collectible. As a 2016 grant recipient from the City of Dallas, he founded a podcast and social incubator to connect inner-city youths with cultural institutions.